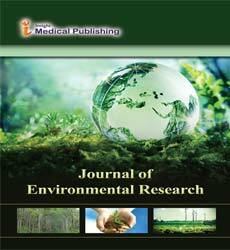 Journal of Environmental Research is an interdisciplinary scholarly periodical that offers peer-reviewed articles in all areas in this field, including mineralogy, oceanology, limnology, soil science, geology, atmospheric science, physical, biological and information sciences, ecology, and geodesy on open access mode. The journal aims to provide scientists, environmentalists and ecologists with up-to-date information on research, strategies, techniques and recent developments with respect to prevention and protection of environment from different pollutants and prediction of future climate change that may have adverse effects on humans and other biological and ecological constituents. The journal includes wide spectrum of topics in this field, including Geosciences, Environmental sciences, Geology, water and soil contamination, geological hazards, environmental impacts, land use management, industrial minerals, waste management, earth sciences, environmental data and information and information systems, broadcasting of knowledge on various techniques, methods approaches that aims at improvement and remediation of the environment as habitat for life on earth. All forms of life and the three environmental matrices of atmosphere, soils, and oceans form a closely integrated network that can be called the “biosphere.” Thus the biosphere is the system with four main internal, interacting components: air, water, soil, and life. Considering this system, what makes the biosphere dynamically distinct from other layers of Earth, such as lithosphere, mantle, or core, is undoubtedly the presence and influence of life. Related Journals: Paleontological Journal, Journal of Earth System Science, Environmental Processes,Journal of Climatology & Weather Forecasting. Biomimicry is a relatively new design methodology that studies nature’s best ideas, abstracts its deep design principles, and then imitates these designs and processes to solve human problems. The term “biomimicry” comes from the Greek words “bios,” meaning “life,” and “mimesis,” meaning “to imitate.” Related to yet also different from terms in earlier use, such as “bionics” and “biomimetics,” biomimicry—an approach popularized by Janine Benyus in her 1997 bookBiomimicry: Innovation Inspired by Nature—entails the “conscious emulation of life’s genius” (Benyus 1997), utilizing design strategies that have been fine-tuned through 3.8 billion years of evolution. Related Journals: International Journal of Control, Automation and Systems, Journal of Control, Automation and Electrical Systems, Process Integration and Optimization for Sustainability,Environment Pollution and Climate Change. Deforestation, clearance or clearing is the removal of a forest or stand of trees where the land is thereafter converted to a non-forest use. Examples of deforestation include conversion of forestland to farms, ranches, or urban use. The most concentrated deforestation occurs in tropical rainforests. About 30% of Earth's land surface is covered by forests. New Forests,Journal of Biodiversity Management & Forestry. Related Journals: BMC Plant Biology, Biology and Fertility of Soils, Biogeochemistry, Fudan Journal of the Humanities and Social Sciences,Journal of Probiotics & Health. Geosciences include environmental geology, environmental soil science, volcanic phenomena and evolution of the Earth's crust. Biologists would analyze subsequent impacts to aquatic flora and fauna from increases in water turbidity. Physicists would contribute by assessing the changes in light transmission in the receiving waters. Related Journals:Journal of Geology & Geophysics, Geosciences Journal, Journal of Earth Science, Science China Earth Sciences. Pollution is the introduction of contaminants into the natural environment that cause adverse change. Pollutants, the components of pollution, can be either foreign substances/energies or naturally occurring contaminants. Pollution is often classed as point source or nonpoint source pollution. Related Journals:Journal of Pollution, Water, Air, & Soil Pollution, Current Pollution Reports, Environmental Science and Pollution Research, Earth Systems and Environment. Atmospheric sciences focus on the Earth's atmosphere, with an emphasis upon its interrelation to other systems. Atmospheric sciences can include studies of meteorology, greenhouse gas phenomena, atmospheric dispersion modelling of airborne contaminants. Related Journals: Journal of Marine Science: Research & Development, Journal of Earth Science & Climatic Change, Journal of the Atmospheric Sciences, Atmospheric and Climate Sciences, International Journal of Atmospheric Sciences. The science that studies how the environment influences human health and disease. Environment in this background, means things in the natural environment like air, water and soil, and also all the physical, chemical, biological and social features of our surroundings. Related Journals:Environmental Sciences, Environmental Health, Environmental Geochemistry and Health, Current Environmental Health Reports. It is a community of living organisms in conjunction with the non-living components of their environment (things like air, water and mineral soil), interacting as a system. The network of interactions among organisms, and between organisms and their environment. Energy, water, nitrogen and soil minerals are other essential abiotic components of an ecosystem. Related Journals:Journal of Ecosystem & Ecography, Ecological Processes, Ecosystems, EcoHealth.